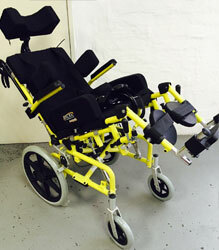 Multi-functional and fully adaptable wheelchair. 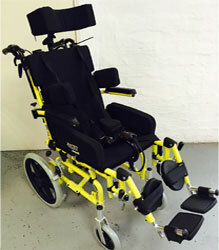 The width of the wheelchair is adjustable to adapt to the user's growth size. Unique design. Removable hardwood base upholstery. 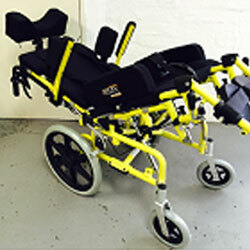 The upholstery included can be moulded to suit the individual (for pressure weight distribution). Heavy duty construction. Fitted with new "Soft Ride" polyurethane airless tyres. 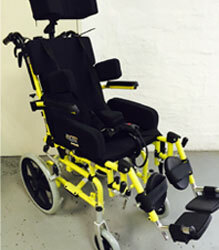 No tyre inflation required Headrest – multi-adjustable. Handle bars – height adjustable. 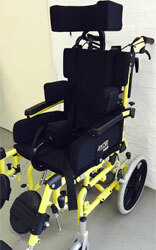 Backrest – solid board – padded – upholstery can be moulded to suit the individual lateral side supports & adjustable. Armrest – flip up angle adjustable. Waist side support – adjustable – removable. Hub brakes. Mag wheels – PU tyre as standard – wheels are interchangable from transit to self propel, transit wheels fitted as standard.